The inspiration for both of these cards was the peacock. I had a lovely peacock feather stamp I wanted to use by Laurence Llewelyn-Bowen. I created the blue background to work on using some canvas textured card, I mixed some clear gesso and acrylic paint and painted the card. 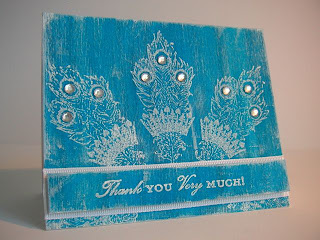 For the first card I stamped the feathers in a semi circle in white ink. I gave the card a distressed look as below. I added a strip of white grosgrain ribbon and two pieces of foam raised the text section of the card. I added some flat backed gems as detail in the feathers. Text is Anna Griffin sentiments. For the second card I simply stamped the peacock feathers in an even pattern using white ink. I created a slightly distressed look by rubbing the ink pad gently over the card, it picked up the grain of the card nicely. I made a bow and glued it to the top of the card. 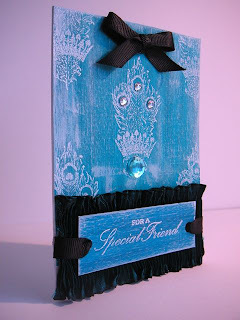 I had a nice piece of teal pleated moire ribbon that I added to the base of the card, I added the text on a separate piece of card and punched two holes in it to thread some ribbon through it. I finished the card off with some flat backed gems. Text is from Anna Griffin In the Garden set.